Perhaps one of the most important developments in head and neck oncology of the past decade is the demonstration that patients with human papillomavirus (HPV)-mediated oropharyngeal cancers have significantly improved outcomes, compared to HPV-negative counterpart patients. This has become the basis for clinical trials investigating the impact on “treatment deintensification” for patients with HPV-mediated oropharyngeal cancers. Unfortunately, the significance of HPV in non-oropharyngeal head and neck cancers is much less certain. Our goal is to systematically review the published data regarding the role HPV in carcinomas of the oral cavity, larynx, sinonasal tract and nasopharynx with respect to HPV detection frequency, viral activity, and association with outcome. We also present preliminary data on HPV16/18 transcriptional status in oral cavity carcinomas, as well as salivary gland neoplasia, as determined by nested reverse transcription PCR for HPV E6/E7 RNA. The weighted prevalence (WP) of HPV DNA detection in 4,195 oral cavity cancer patients is 20.2 %, (95 % CI 16.0 %, 25.2 %). HPV16 is the most common type detected. Importantly, no data currently demonstrates a significant association between the presence of HPV DNA and improved outcome. The WP of HPV DNA in 1,712 laryngeal cancer patients is 23.6 %, (95 % CI 18.7 %, 29.3 %). Similarly, no association has yet been demonstrated between HPV DNA status and outcome. The WP of HPV DNA detection in 120 sinonasal cancer patients is 29.6 % (95 % CI 17.8 %, 44.9 %), and in 154 nasopharyngeal carcinoma patients is 31.1 %, (95 % CI 20.3 %, 44.5 %). Recent preliminary data also suggests an association between HPV and certain salivary gland neoplasms. The clinical significance of these findings is unclear. The published data strongly support the need for studies on patients with oral and laryngeal carcinomas that will be powered to find any differences in clinical outcome with respect to HR-HPV and p16 overexpression. Barwad A, Sood S, Gupta N, et al. Human papilloma virus associated head and neck cancer: a PCR based study. Diagn Cytopathol. 6 Apr 2011. doi: 10.1002/dc.21667. Pannone G, Rodolico V, Santoro A, et al. 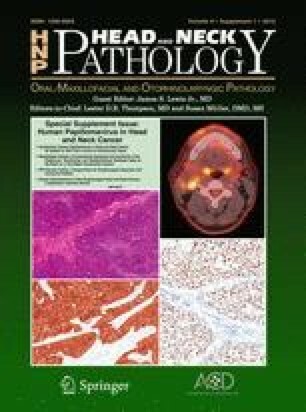 Evaluation of a combined triple method to detect causative HPV in oral and oropharyngeal squamous cell carcinomas: p16 immunohistochemistry, consensus PCR HPV-DNA, and in situ hybridization. Infect Agent Cancer. 2012;7:4. doi: 10.1186/1750-9378-7-4. Sethi S, Ali-Fehmi R, Franceschi S, et al. Characteristics and survival of head and neck cancer by HPV status: a cancer registry-based study. Int J Cancer. 23 Oct 2011. doi: 10.1002/ijc.26500.